ABOVE: David Smith, Agricola V, 1952. Steel, 35 1/2 x 28 x 10 1/2. Private collection, New York. Photo: © 2006 The Estate of David Smith/Licensed by VAGA, New York. Tours are free with museum admission. All tour times are subject to change. For daily schedules, consult the electronic signboard located near the Admission Desk. Join Guggenheim Museum curators for tours of current exhibitions. Tours held on the following Fridays @ 2 PM. Join members of the Guggenheim's education staff for tours and interactive discussions of the current exhibition. Tours held Fridays @ 2 PM. This docent-led tour introduces Frank Lloyd Wright's architecture, the history of the Solomon R. Guggenheim Museum, highlights from the permanent collection, and David Smith: A Centennial. Docents introduce some of the artist's seminal sculptures along with biographical notes, quotes, and anecdotes, giving the visitor a fuller appreciation of his milieu within the New York avant-garde and his contributions to 20th-century sculpture. Docents introduce some of the artist's seminal sculptures along with information about his materials, his process, and the sources of his inspiration, giving the visitor a fuller appreciation of Smith's aesthetic concerns and his contributions to 20th-century sculpture. Join us on the evening of the exhibition opening for a members-only viewing of David Smith: A Centennial. Take advantage of free, guided tours and wind down for the weekend with cocktails and music. Members at the Individual Level and above are welcome to attend. The Guggenheim is proud to continue this monthly social event. Check out our current exhibition and enjoy a night of music by world-class DJs, dancing, cocktails, and art. Admission $15 (cash only at the door), FREE for Guggenheim members. Sponsored by Village Voice. Music curated by Flavorpill. Exclusive events for members of the Patrons Circle. For more information, call (212) 423-3624 or e-mail patronscircle@guggenheim.org. Join Guggenheim Curator Nat Trotman for an inside look at the new exhibition David Smith: A Centennial. A light breakfast is provided. In conjunction with David Smith: A Centennial, journey upstate to Storm King, a collection of outdoor sculpture built around 13 seminal Smith pieces. A Guggenheim curator accompanies the trip, which includes a stop for lunch along the way. Corporate Courtesy Cardholders are invited to a champagne reception and private, after-hours tour of David Smith: A Centennial. For more information please call Jessica Warner at (212) 423-3521. Unless otherwise noted, tickets are $10 ($7 for members, students, and seniors). For more information, call the Box Office at (212) 423-3587. 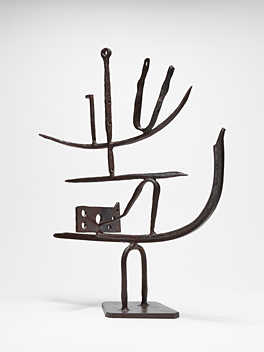 What is one to make of the "primitivism" of David Smith, of the references to myths, totems, birds, and rituals that permeate his work almost from the beginning? Wrestling with some of Smith's driving impulses and issues, author, independent curator, and former New York Times critic Michael Brenson takes us on an aesthetic and intellectual journey as daunting as it is essential. Michael Brenson is currently writing a biography of David Smith. An international and cross-generational group of sculptors share their personal insights into David Smith and debate his impact and his relevance to sculpture in a new century. Moderated by Michael Brenson. Artist Participants: Richard Deacon, Rachel Harrison, Alain Kirili, Tom Sachs. This lecture traces two of David Smith's central concerns: unity and identity. By focusing on Smith's insistence on the visual nature of sculpture, its power as symbolic language, and his need to create unity from tremendously varied and fragmented sources, Mr. Stevens examines the unique protean force of David Smith's artistic achievement. The symposium schedule on March 11 begins with refreshments at 10 AM and an introduction by Michael Brenson at 10:30. There is a lunch break from 1–3 PM and a reception to follow the close of the symposium at 6 PM. From early experiments with collaged negatives and cameraless photographs to carefully "staged" portraits of his sculpture, photography played an important role throughout David Smith's career. Smith's photographs are discussed in relationship to his work in other mediums, as well as in their historical context. Panelists: Elizabeth Brown, Sarah Hamill, and Joan Pachner. David Smith's origins as a painter and draftsman infused his sculpture with a distinctly visual presence and a unique relationship to its surrounding environment. Panelists address the context and meaning of Smith's painting with a focus on his ambitious and innovative integration of two- and three-dimensional mediums, into something that, in his words, "would beat both." Panelists: David Batchelor, Harry Cooper, Ann Lauterbach, and Karen Wilkin. What would four different visual thinkers have to say about an abstract sculpture? Would they agree on some things and argue about others? Is it possible for multiple readings of a single object to provide deeper meaning and greater comprehension? Come if you are curious and consider saying a few words yourself. Participants include: Joel Shapiro, John Newman, Carmen Gimenéz, and Rebecca Smith. This exploration of the roots of David Smith's work and the influence of Martha Graham's dance features drawings, photographs, sculpture, and a live performance. A discussion follows, focusing on the intellectual brew of New York's intimate art world of the late 1920s and '30s. Participants: David Anfam, Janet Eilber, Mark Franko, and Candida Smith. Noted scholar of modern sculpture Anne M. Wagner looks afresh at a few key works—among them Home of the Welder and The Letter—to consider the terms the artist found to figure domestic spaces and the emotions that haunt them. With this reading of Smith's work, Wagner opens a new perspective on David Smith for viewers today. Professor of Modern Art at the University of California at Berkeley, Wagner writes frequently about 20th-century art, and has just published Mother Stone: The Vitality of Modern British Sculpture (Yale University Press). An interview with David Smith and Frank O'Hara from the 1964 program Art New York is screened in the New Media Theater in the Sackler Center for Arts Education. Directed by Bruce Minnix and Ina Korek, this film offers a chance to hear the artist's voice. Film material courtesy of the Museum of Modern Art. As part of its 80th anniversary celebration, the famed Martha Graham Dance Company performs two seminal dances by the great choreographer, Martha Graham. Included in the 30-minute program is Deep Song (1937). In the Peter B. Lewis Theater. Free with museum admission. Explore how drawings and photography inspired David Smith's process to create sculpture. Children and their adult companions create sculpture using found materials, and then photograph their sculptures to import images into Adobe Photoshop. Instructor: Rosanna Flouty, Manager for New Media. Open to children ages 7-13 with an adult companion. $20 for one child, plus one free adult ($15 for members' children); $15 per additional adult or child. To register, please call (212) 423-3587. High-school students explore the work of American artist David Smith and his interest in drawing as a process to create sculpture, and then make their own site-specific sculptures in 3D. Open to high-school students ages 14-18. No prior multimedia experience necessary. Free of charge, but registration is required. Contact Rosanna Flouty, Education Manager for New Media, at (212) 423-3532 for an application. Afternoons become a learning adventure for kids as they tour the museum's spectacular Frank Lloyd Wright–designed architecture, discover masterworks by well-known artists, and explore great works of sculpture by David Smith. Children participate in interactive gallery visits and hands-on workshops experimenting with techniques from clay to digital media in individual and team projects. The program culminates with a showcase where students invite their families to view their work. Open to children ages 8–11, $275 ($250 for members). To ensure individual attention, this program is limited to 15 participants. For information or to register, call (212) 423-3637. Join us for an afternoon of looking, learning, and mingling with colleagues. Tour David Smith: A Centennial and learn about upcoming programs. Receive curriculum materials and meet the Education Department staff. RSVP to (212) 360-4231 or schoolprograms@guggenheim.org by February 10. In conjunction with the exhibition David Smith: A Centennial, this workshop offers an opportunity to explore both the exhibition and ideas for engaging students in making sculpture. Educators visit the galleries and then explore several approaches related to Smith's process in the Studio Art Lab. Instructor: Sharon Vatsky, Senior Education Manager. $20 per educator ($15 for members). To register, call (212) 423-3637.